Anyone fancy a game of footy on a gravel oval or visiting the Hells Gates? The West Coast of Tassie is rugged, beautiful and remote and is known for its mining and aquaculture industries, world heritage environment, unique townships and resilient people. We’ve had the pleasure of working with the West Coast Council on a Sport and Recreation Review and Strategy and as part of the project visited the legendary gravel oval in Queenstown and Hells Gates on the West Coast. The heritage listed footy field boasts a 100-year history and is a must see on your Tassie travel itinerary along with the Hell Gates the name given to the mouth of Macquarie Harbour a notoriously and shallow channel entrance to the harbour. In May we travelled across the rugged, mountainous region to the towns of Queenstown, Zeehan, Strahan, Rosebery and Tullah, and everywhere in between – talking to locals, running community workshops and visiting all sorts of sport and recreation facilities. We were blown away by the region’s natural beauty and resilient people. The region has undergone significant changes in recent times and is taking on the challenge of diversifying the economy and developing new industries. We have worked in a lot of Australia’s mining regions. While there might be stark contrasts between Tassie’s West Coast and places such as East Arnhem Land in the Top End or Port Hedland in Western Australia, when it comes to many of the challenges they are facing relating to sport and recreation – these communities are not alone! a demonstration of the development of recreational places in rural communities… a rare example on a state and national level of a ground with a gravel treatment, the surface of which mirrors the surrounding dramatic landscape. 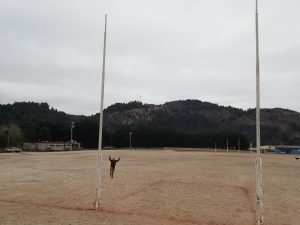 The oval also has meaning to the community as a regular recreational meeting place and symbol of the toughness of the people of the rugged and isolated West Coast. The oval was inducted in to the Tasmanian Football Hall of Fame in 2007. Those who call it home are often accustomed to the unique surface (some even prefer it over turf) while many opponents aren’t so keen. For many avid footy fans, such as me in the photo below, a visit of the Gravel is on the bucket list. In its location nestled in the Tasmanian Wilderness, it is not likely you will stumble across it on your way to somewhere else – but it is well worth the magnificent road trip to get there!